"Gladys and Annie Barnes are impoverished sisters who have seen better times. They live in a modest cottage in the backstreets of Highate with Mr Fisher, a mild but eccentric old man living secretively in the attic above them. Their quiet lives are thrown into confusion when a new landlord takes over, a dreaded and unscrupulous 'rackman'. He installs his wife in part of the cottages in the hope that there she will recover from an unspecified malady. With a mounting sense of fear, Gladys and Annie become convinced she is possessed by an evil spirit..."
When an author has such success with just one novel from their back catalogue (in Stella Gibbons' case, Cold Comfort Farm), it is perhaps tempting to avoid releasing the rest of their works so many years after they were originally published in order to avoid the risk of criticism that this exposes them to - after all, they have a lot to live up to when the writer's most successful work has sold millions and been made in numerous stage and film adaptations. So how far has it paid off in Gibbons' case? Many of her other works prove incisive, well-developed, humorous, and tautly told, with winning characters to boot. My American is one such work which stands up sufficiently on its own to rival the strength of Cold Comfort Farm and its sequels, and Gibbons' short stories are also promising. However, others, such as Nightingale Wood, are readable enough at the time but ultimately prove forgettable. Starlight falls somewhere in between the two. While perhaps not a long-lasting classic in the way of My American, it has too intriguing and distinctive a basis to be best consigned to the annals of history in the way of Nightingale Wood. The main characters are potentially charming, but are frequently too caricatured in appearance and in foibles of speech to be taken in any way seriously. The relationship between Peggy and Arnold is equally improbable and the reader at no point truly believes in it, meaning its resolution seems equally implausible. The at-times solid relationships and situations that Gibbons does create for us in Starlight, though, are frequently let down by a lack of detail. For instance, it is not clear why the 'rackman' (or landlord) would strike such fear into the hearts of Gladys and Annie, and it's possible that today's readers require a little more historical context for a fuller understanding (even extensive Googling furnishes the 21st-century reader with no further enlightenment). 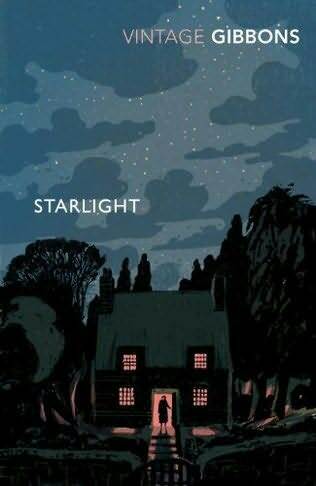 The concept of 'starlight' is only thinly threaded throughout the novel, in a way that is nowhere near substantial enough to make the link with the title obvious. Subplots (such as Gladys' relationship with her former employer, or Peggy's relationship with her current one) are glossed over and rushed and the reader is left feeling as if they have missed out in some way. This lack of attention to detail (which is most uncharacteristic of Gibbons' work) results in an equal deficiency of empathy and sympathy towards the characters, and even those that we should have arguably cared about the most (such as the lovable yet eccentric Mr Fisher, or the long-suffering Erika) have their stories cut short or so rushed that we cannot care too much about how they end up. It is a shame that a story with such a unique and original basis could have fallen so short of expectations, especially as it does not seem that it was beyond Gibbons' capabilities to fulfil these. From all of these observations, great hope in the novel can still be found. Although imperfect, it merits a second read so that readers can extract details that they may have missed the first time through, and certainly has a place among Gibbons' more widely-read works. A full list of works by Stella Gibbons can be found here.